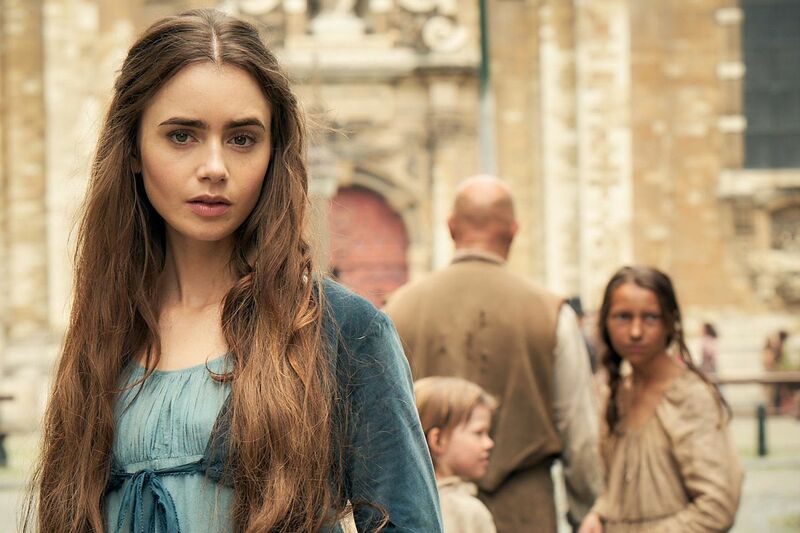 Lily Collins plays Fantine, a young woman who is abandoned by her lover and must make her way with her daughter, in the "Masterpiece" production of Victor Hugo's "Les Miserables," premiering Sunday. Game of Thrones. Maybe you’ve heard of this show? It’s back for one final, six-episode season. 9 p.m. Sunday, April 14, HBO. Les Miserables on Masterpiece. There’s more than one epic costume drama starting this weekend. If you’ve experienced Victor Hugo’s story only through the musical, you may be surprised by how much more of it there is when no one stops to sing. Dominic West stars as Jean Valjean, David Oyelowo as Inspector Javert, and Lily Collins as Fantine. 9 p.m. Sundays, April 14-May 19, WHYY12. Frontline: Marcos Doesn’t Live Here Anymore. David Sutherland (The Farmer’s Wife, Country Boys) directs this joint presentation with Independent Lens and Voces about Marine Corps veteran Elizabeth Perez’s efforts to bring her family back together after the deportation of her husband to Mexico. 9 p.m. Monday, April 15, WHYY12. Bless This Mess. More than 50 years after the debut of Green Acres, we get another comedy about city folk who think they can farm. This one, which stars Dax Shepard (Parenthood) and Lake Bell as New Yorkers who leave the rat race behind for a crumbling farmhouse in Nebraska, is about as subtle as a cow plop. But I like the cast, which also includes Pam Grier and Ed Begley Jr., and I want to believe it will get smarter. It wouldn’t take much. 9:30 p.m. Tuesday, April 16, ABC. There She Goes. David Tennant and Jessica Hynes play the parents of a daughter with developmental disabilities in a sharply executed comedy making its U.S. debut on the British-focused streaming service. It’s based on the experiences of the show’s creator, Shaun Pye, whose daughter has a so-far-unclassified chromosomal disorder. Let’s just say it doesn’t paint him as any kind of hero. Tuesday, April 16, BritBox. Bosch. Philly’s Titus Welliver returns for a fifth season as Michael Connelly’s iconic LAPD detective, with the story picking up 15 months after the events of the last, and Bosch working undercover. Friday, April 19, Amazon. Ramy. Ramy Youssef cocreated and stars in this new streaming comedy about a young Muslim man living in New Jersey, navigating a secular world while trying to remain true to his faith. Friday, April 19, Hulu.